Bondi Beach (pronounced as 'bon-dye' and not 'bon-dee') is a popular beach and the name of the surrounding suburb in Sydney, New South Wales, Australia. Bondi Beach is located 7 km (4 mi) east of the Sydney CBD. 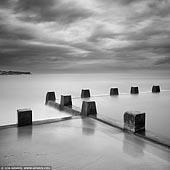 "Bondi" or "Boondi" is an Aboriginal word meaning water breaking over rocks or noise of water breaking over rocks. The Australian Museum records that Bondi means place where a flight of nullas took place. Bondi Beach is an internationally recognised Sydney beach and one of Sydney's most stunning beaches. While golden sands, turquoise waters and perfect waves make Bondi Beach an iconic Sydney attraction, there is plenty to do beyond the surf. Fine dining, eclectic shopping markets, gorgeous coastal walks and a buzzing nightlife can all be experienced in Bondi. Each year tens of thousands of people, from backpackers to billionaires, take to the golden sands of this wide, one-kilometre long city beach expanse to walk, jog, or just soak up the sun. Being only a few kilometres from the city centre, Bondi Beach is one of Sydney's busiest beaches. There's a host of events held here all year round from community art shows to city to surf running marathons. Bondi has become a favourite of the "barmy army" of British tourists, who annually gather on its sands for a Southern Hemisphere Christmas in the sun. Bondi is home to numerous youth hostels with backpackers who congregate mainly in the summer months. It is not uncommon to hear Norwegian, Portuguese, French, German, Dutch, Swedish, Danish or Spanish while walking across the beach or through the cafes. To discover more stunning beaches nearby, take the trail to Tamarama, Bronte and Coogee> via the scenic coastal walk. From the cliffs on the six-kilometre Bondi to Coogee Walk you can see the entire expanse of Bondi Beach. Each spring, the Bondi to Tamarama Beach section of the walk is transformed by the Sculpture by the Sea exhibition with works by local artists. Bronte can be a dangerous beach for swimmers, but is popular with surfers. Bronte Baths, also known as the Bond Ocean Pool after lifesaving pioneer, Major Bond, is located at the south end. Many locals swim from head to head all year round. The beach is well patrolled in the warmer months. 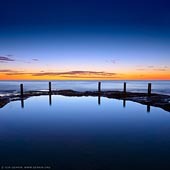 Coogee Beach is a beautiful shimmering beach only 20 minutes from the busy centre of Sydney, NSW, Australia. The beach is popular for swimming and famous for its dangerous shorebreaks. The name Coogee is said to be taken from a local Aboriginal word koojah which means "smelly place". Another version is koo-chai or koo-jah, both of which mean "the smell of the seaweed drying" in the Bidigal language or "stinking seaweed", a reference to the smell of decaying kelp washed up on the beach. After Bondi Beach, Coogee is probably the most popular of Sydney's beaches that face the Pacific Ocean and back on to the City's Eastern Suburbs. At Coogee Beach's northern end below Dolphin Point, Giles Baths is what's known as a 'bogey hole' - a semiformal rock pool open to the surging surf. At the beach's southern end, Ross Jones Memorial Pool has sandcastle-like concrete turrets. Coogee Beach is a great place to eat, surf and swim. Visitors and locals enjoy the hospitality and exciting night-life of the Coogee Bay Hotel, the Crowne Plaza Coogee Beach and the Coogee Palace bars. A wide variety of accommodation is available within walking distance of the sand and surf including holiday apartments - boutique hotels - backpacker hostels and luxury self catering rentals. While in Coogee you must explore the beautiful coastal walks, the lush parklands with free outdoor barbeque and picnic facilities, the children's play areas or you can just relax on one of the finest sand beaches in the southern hemisphere.